Goals is a free goals application that lets you create personal goals that you aim to achieve. This free goals application lets you create your own goals and monitor you goals effortlessly. This free goals application provides you with additional motivation to achieve your desired goals. The main interface is divided into 3 different section which are Today, My Goals and My profile. Today section shows current day’s total goals, goals confirmed on the main interface itself. 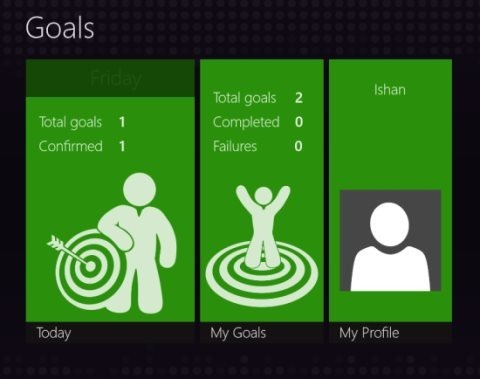 Likewise, My goals section shows total goals, completed goals, and failures on the main interface. Creating a goal is a very simple process. For creating a goal you need to click either the Today section or My Goals section. Today section lets you create goals to be achieved on the current day itself. My Goals section even allows you to create goals and monitor the goals progress. For creating a goal, you need to simply click the create goal option within My goals section and feed in some information like your goal name, group, start date, end date, comments. You are even allowed to set the Priority level and goal criterion. After entering all these information, you need to click the OK button. Yes, you have created a goal which you need to achieve within the time limit specified. Don’t forget to check out our post on Windows 8 shopping app Shop It. The good part is that this goals application displays few motivational thoughts to motivate you for achieving your goal. My Profile section basically takes the user name of your Windows 8 and shows you total goals, completed goals and failures. If you are looking for a simple and motivational tool to create and monitor your goals, then i would suggest you to try out this goals application for free. Hi! I am the one of the developer of this app. Thank you for you review, we are very pleased! I don’t understand after you mark a goal as confirmed (whatever that means) how you change it to be completed?